Villa Maria attack Hannah Young faces tight defense from Kennard-Dale defender Jenna Soukaseum during the second half of the PIAA Class 2A girls' lacrosse championship game Saturday, June 9, 2018, at West Chester East. Villa went on to win, 17-5. Late-game heroics gave Methacton an 8-7 overtime win over Central Bucks West in a non-league girls’ lacrosse game. Jayme Weber scored the game-winning goal with 2:06 left in overtime after Sydney Tornetta scored the game-tying goal with less than five seconds left in regulation. Tornetta scored twice and had three assists. Katy Benton also scored twice for the Warriors, who improved to 5-1. Jenn McCarry scored the game-winning goal with one second left in Upper Dublin’s 19-18 win over Boyertown. McCarry and Jackie Rama each finished with three goals and one assist. Mack Moore scored a game-high seven goals for the Cardinals and dished five assists. Amanda Diachynsky and Erin Gilbert each scored five goals for Boyertown. Clara Page scored four goals in Baldwin’s 10-7 win over Shipley. Natalie Sgro also had a multi-goal game with two goals. Olivia Tornetta made nine saves for the Bears. Emily Matson scored a game-high seven goals in George School’s 14-6 win over Conwell-Egan. Sara Matson scored a hat-trick for the Cougars. Alexandra Long and Eva Kinnel each scored twice. Long had four assists, while Kinnel had two. Irion Thompson made 12 saves for the Cougars. Ally Muller scored five goals in Abington Friends’ 9-5 win over Little Flower. Muller also helped the Kangaros gain possession by winning four draw controls. 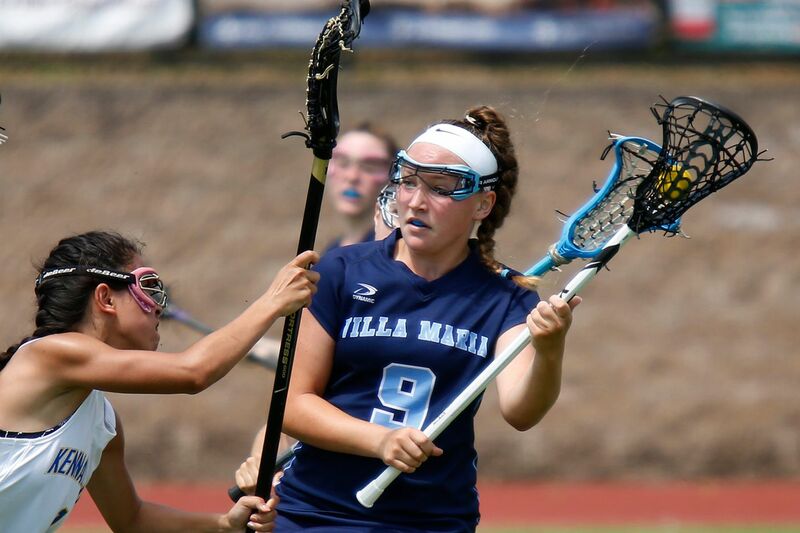 Villa Maria came back from a one-goal halftime deficit in its 16-8 win over Gwynedd Mercy. Villa Maria outscored the Monarchs 11-2 in the second half. Margie Carden scored six goals for the Hurricanes, and Bridget Finley scored four times. Abby Walheim had a 10-point game with two goals and eight assists. The Hurricanes improved to 6-0. Notre Dame beat Germantown Academy, 13-11, to pick up an Inter-Ac League win. Hannah Gillespie led the Irish with four goals. Maggie O’Brien netted a hat-trick and scooped up six ground balls. Penn Charter’s strong first half pushed the Quakers to a 10-7 win over Springside Chestnut Hill. Penn Charter outscored the Blue Devils 8-1 in the first half. Mia Ferraro scored a hat-trick, and Emma Wilson scored twice for the Quakers. Cole Witoslawski scored four goals in Souderton’s 6-5 win over Pennsbury. Matt Rauch scored a goal and had an assist for Souderton, and Axell Beskar had a 12-save performance in the cage. Mia Cohen allowed just two hits and struck out six hitters in Friends Select’s 15-1 win over Germantown Friends. Cohen, Hannah Sieg and Camryn Harvie each went 3-for-4. Izzy Dean went 3-for-3 for the Falcons in their Friends Schools League win. Upper Dublin’s Peter Johnson and Karan Acharya combined to no-hit Abington in the Cardinals’ 2-0 win in a Suburban One League American Division matchup. Johnson went 5 1/3 innings, allowed four walks and struck out eight hitters. Acharya earned the save with 1 2/3 innings of relief. He struck out three hitters and walked one. Jacob Womelsdorf had an RBI for Upper Dublin. Logan Keller drove in both runs in Haverford School’s 2-1 win over Springside Chestnut Hill in Inter-Ac League play. Keller hit a game-tying home run in the first inning and knocked in Luke Kania in the third inning for the go-ahead run. Souderton defeated Dock Mennonite, 27-25, 23-25, 25-17, 25-23. Aidan Wunderly recorded 17 kills and 13 digs for Souderton. Jimmy Wert also recorded double figures in kills with 15. Luke Pagan set up his teammates with 44 assists and also served five aces. Friends’ Central defeated George School, 184-204, in its Friends Schools League opener. John Bradbeer shot 39 on the par-35 course at Middletown Country Club in Langhorne.